Schrodinger was on to something when he posited that a cat inside a box could be both alive and dead, because cats do not seem bound to the same laws of physics as us – they can become water, they can disappear into the shadows, and now, apparently, cats can also be plants. 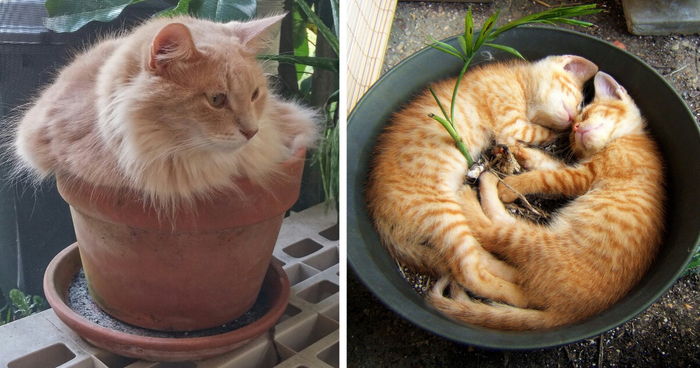 If you have any photos documenting cats' miraculous transformations into household plants and shrubs, please share them with us. These photos just might help scientists unlock the mysteries of the universe. this kitty is high on pot. get it? why did someone just wake us ?? I voted UP an extra time for the photo title. Pots are the gateway container. Love orange kitties! This one is adorable in his pot! #20 Ain't I Flowering ? #24 What Kind Of Plant Is This? I bet that terra cotta warms up nice and toasty! #45 Who Needs A Couch? #46 Worrying About The Drought Is Exhausting. could be my Charlie's identical twin! crazy! #51 Not Only Cats! Her Name Is "puss" So Maybe That's Why. #54 Little Paula Loves The Flower Pot. And The Wooden Birdie. #66 I S-pot-ted The Cat! #67 Panthro Enjoys Heights From Grandma's Pot! #75 Water Me! I Dare You! Love his mustache! Too cute! #78 Potted Kidden. If It Fits, It...sleeps. #80 Lua Bear-just Add Water. #82 Tito 'why Did You Wake Me' ! Add Water, I dare you! #84 Mr. Eye In Flowerpot. #89 Very Own Little Potted Plant Supervisor! #92 Penny On The Balcony! !